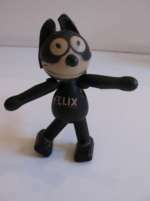 Felix the cat, Hand painted early Gama,Germany tin toy. Comic. 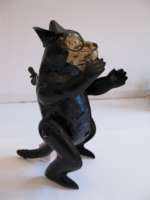 Felix the cat, Hand painted early Gama toy (Georg Adam Mangold,Fürth) Made about 1920. Clockwork working fine. Good condition.Comic. Probably the earliest Felix the Cat. H=17 cm/ 6 3/4" Literature:see: Ulrich Schweizer,GAMA,Die Spielzeuge von 1882 bis 1945,The toys from 1882 until 1945,Tin and Toys Verlag,2010. .David Longest,Character Toys and Collectible,Collector Books. Tinplate hand painted clown on donkey from Günthermann,Germany.